Paris St-Germain missed the chance to go top of Ligue 1 ahead of Marseille as their nine-match winning run came to end with a draw at Lille. 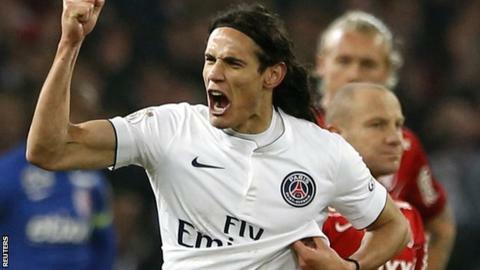 Striker Edison Cavani converted a right-wing cross from Ezequiel Lavezzi to put the visitors ahead. Lille defender David Rozenhal met Sebastien Corchia's corner to equalise five minutes before half-time. Rozenhal benefitted from an error by PSG goalkeeper Salvatore Sirigu who punched a cross on to his own crossbar. Marseille stay a point ahead of PSG at the top despite being held to a 1-1 draw against Lorient on Tuesday. Match ends, Lille 1, Paris Saint Germain 1. Second Half ends, Lille 1, Paris Saint Germain 1. Foul by David Rozehnal (Lille). Michael Frey (Lille) wins a free kick in the attacking half. Foul by Rio Mavuba (Lille). Franck Beria (Lille) wins a free kick in the defensive half. Corner, Paris Saint Germain. Conceded by Vincent Enyeama. Attempt saved. Lucas Moura (Paris Saint Germain) header from the centre of the box is saved in the top right corner. Assisted by Javier Pastore with a headed pass. Jean-Christophe Bahebeck (Paris Saint Germain) wins a free kick in the attacking half. Foul by Idrissa Gueye (Lille). Foul by Jean-Christophe Bahebeck (Paris Saint Germain). Substitution, Lille. Michael Frey replaces Nolan Roux. Attempt missed. Jean-Christophe Bahebeck (Paris Saint Germain) right footed shot from outside the box is high and wide to the right following a corner. Substitution, Paris Saint Germain. Jean-Christophe Bahebeck replaces Blaise Matuidi. Corner, Paris Saint Germain. Conceded by David Rozehnal. Attempt missed. David Luiz (Paris Saint Germain) right footed shot from outside the box is close, but misses to the left from a direct free kick. Offside, Paris Saint Germain. Marco Verratti tries a through ball, but Blaise Matuidi is caught offside. Attempt saved. Lucas Moura (Paris Saint Germain) right footed shot from the right side of the box is saved in the centre of the goal. Assisted by Edinson Cavani. Offside, Lille. Vincent Enyeama tries a through ball, but Nolan Roux is caught offside. Attempt saved. Edinson Cavani (Paris Saint Germain) right footed shot from the centre of the box is saved in the bottom right corner. Assisted by Thiago Motta. Nolan Roux (Lille) wins a free kick in the defensive half. Substitution, Lille. Pape Souaré replaces Marvin Martin. Attempt missed. Edinson Cavani (Paris Saint Germain) right footed shot from very close range is close, but misses to the right. Assisted by Gregory Van der Wiel with a cross. Divock Origi (Lille) wins a free kick in the defensive half. Attempt missed. Marvin Martin (Lille) right footed shot from outside the box is too high. Assisted by Divock Origi. Attempt missed. Nolan Roux (Lille) header from the centre of the box is just a bit too high. Assisted by Marvin Martin with a cross.